Where can I find the serial number on my golf car? The serial number on a golf car is most often found near the passenger side glove box area, under the charger port (on electric cars), or the choke (on gas cars). You can also find your serial number by using the E-Z-Go serial number lookup tool, or by clicking on “Serial Number Lookup” on the top right of E-Z-Go’s main page. How can I find the make, model, and year of my E-Z-Go golf car? Use the My Vehicle tool on E-Z-Go’s website to find this information. I need to know if a specific part will fit in my vehicle. When looking at a specific part or kit, click on the “Vehicles” tab to find a drop-down menu of every vehicle compatible with that part number. You can also use the My Vehicle tool to find compatible parts based on your make, model, and year. I’m searching for a part number, but it doesn’t seem to be working. If your part number includes a dash, make sure to remove it. For instance, instead of typing 60625-G05, try 60625G05. Be sure that the entire number is included. Will I have to pay sales taxes on my vehicle? Garrett’s Golf Cars, LLC is a retail site, and as such we are required to charge sales tax. For information on possible tax exemptions, please contact us directly by phone at (864) 862-7709 for our Fountain Inn location or at (843) 881-8894 in Mt. Pleasant. You can also contact us online. What kind of oil to gas ratio should I be using for a 2-cylinder vehicle? What about 4-cylinder? The best oil-to-gas mixture ratio for 2-cylinder engines is 1 ounce : 1 gallon. 4-cylinder engines do not require a mixture and can simply take gasoline. What brands are available to purchase from Garrett’s? For new vehicles, we offer E-Z-Go and Cushman. More variety may be available in our pre-owned inventory — contact us for more information. Will our vehicles have seat belts? Seat belts are standard for all street-legal vehicles. Vehicles without rollover protection can have seatbelts installed for an additional cost. How can I really make my battery power last? Clean batteries with a baking soda and water solution (¼ cup baking soda mixed with 1.5 gallons or 6 liters of clear water) with a garden-type sprayer. Use a sprayer that has a non-metallic spray wand. 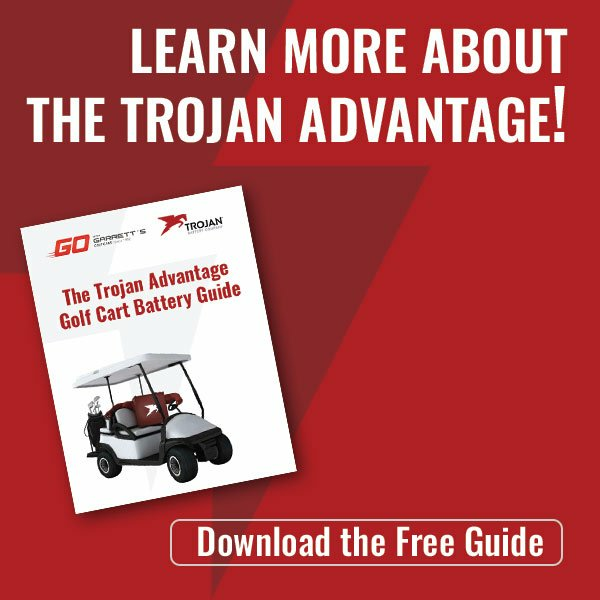 Charge your golf cart after each use. Batteries do not have a memory, so they don’t need to be discharged before charging. Allow 10 - 14 hours for charging. Only remove once the charger has shut off on its own. What is the best way to clean my windshield? Clean the windshield using a wash cloth and a very mild soap-and-water solution. Do not use glass cleaner with ammonia (like Windex) or multi-surface cleaners. These products will lead to windshield cracking and serious long-term damage. For best guidelines, please see your owner’s manual. It will provide complete information regarding engine maintenance, service, and safety. We recommend checking the oil level every month at minimum. If your golf cart is used often, you’ll want to check on it more than that. You’ll need to replace your engine oil and filter semi-annually, generally once it hits around 125 rounds or 600 miles of usage. For new engines, your initial oil change should be after 8 hours of run time. 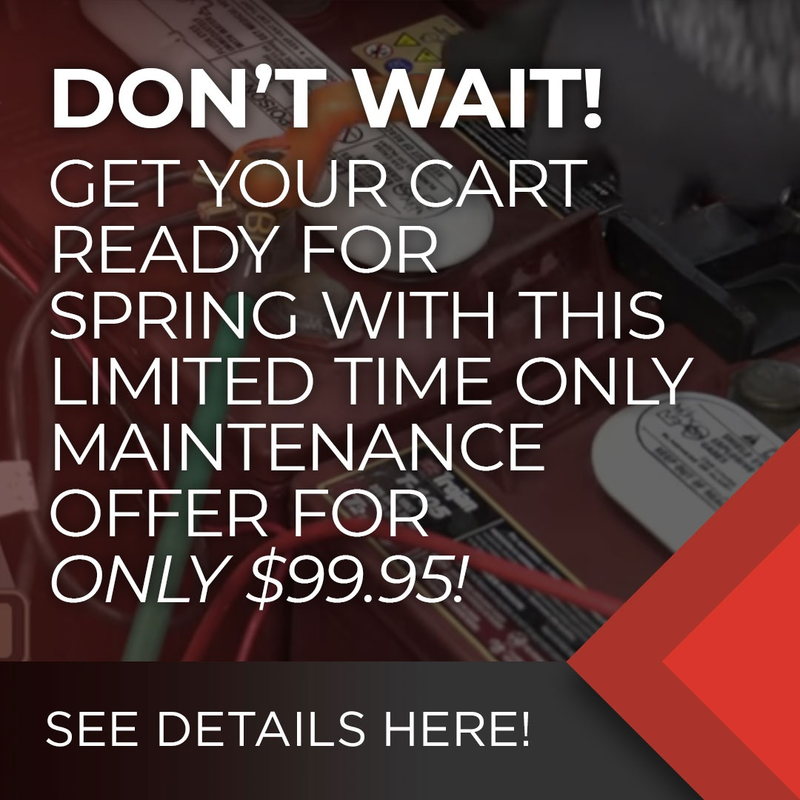 Use 10W-30 oil for your golf car. How often should I check my battery’s electrolyte level? If I need to fill, what is the correct level? Check your battery’s electrolyte levels monthly. The correct level is ½” (or 13mm) above the plates in each cell. This level leaves around ¼” - ⅜” (6-10 mm) of space between the electrolyte level and the vent tube. For complete information and safety guidelines, see your owner’s manual. What are all the blinking lights on my charger, and what do they mean? Red flash = fault code, charging error. For a description of fault codes and advice on how to handle these errors, see your owner’s manual. Didn’t see your question here, or looking for a little bit more by way of an answer? We’d be happy to speak with you! Just give us a call at (864) 862-7709, (843) 881-8894, or contact us online.